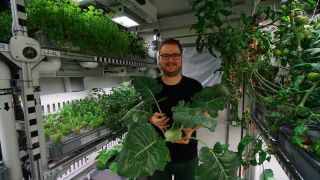 DLR researcher Paul Zabel poses with kohlrabi harvested from the EDEN ISS Antarctic greenhouse. "After more than half a year of operation in Antarctica, the self-sufficient greenhouse concept appears to be effective for climatically demanding regions on Earth, as well as for future manned missions to the moon and Mars," DLR officials said in the statement. "The harvests are now so plentiful that some of it does not always make it straight to the table, and we now have the luxury of spreading out our consumption of some refrigerated lettuce and herbs over several days," Paul Zabel, a DLR researcher who works with EDEN ISS, said in the statement. "The overwintering team members are always looking forward to their next fresh meal." A thermotransport box sits in front of the Antarctic greenhouse EDEN ISS, which tests the ability to grow food in Mars-like conditions. The haul included 170 lbs. (77 kilograms) of lettuce, 112 lbs. (51 kg) of cucumbers, 64 lbs. (29 kg) of tomatoes, 26 lbs. (12 kg) of kohlrabi, 20 lbs. (9 kg) of herbs and 11 lbs. (5 kg) of radishes. All of the crops were produced in a cultivated area measuring just 140 square feet (13 square meters). However, the peppers and strawberries failed to produce a harvest, likely due to pollination issues, according to the statement. While Zabel tended to the planets when possible, stormy conditions in Antarctica often prevented him from walking the quarter mile or so (about 400 m) outdoors to the greenhouse. In those cases, a control center in Bremen, Germany, took over for as long as three consecutive days. When conditions allowed, Zabel could perform urgent repairs, such as fixing a screw that came loose in the thermal system. The path to EDEN ISS in the Antarctic. Other tasks for Zabel included looking at the quality of the harvest, picking up microbiological samples and checking on the systems (light, temperature regulation, and air supply enriched by nutrients and carbon dioxide). His responsibilities even included reporting on how the fresh food improved the health of his team members. "We greatly value and enjoy the fact that regularly fresh salad, herbs and vegetables from the greenhouse enrich our diet. The positive effect is noticeable," Bernhard Gropp, Neumayer Station III manager, said in the same statement. Without the fresh produce, the crew would have to live on freeze-dried supplies until the next flight to Antarctica in October, DLR officials noted. The EDEN ISS project website also provides regular updates to the public, including photos of the individual boxes that are taken every day. You can follow the project at DLR.de/EDEN-ISS or by using the hashtag #MadeInAntarctica on Twitter.